Unlike many other minimap mods, Xaero's minimap keeps the aesthetic of vanilla Minecraft which might even make you forget that it was a mod in the first place. It's also the first rotating square minimap for Minecraft. There is a toggle to make it lock north and not rotate. There are 2 mod editions, full and fair-play (designed for multiplayer). You can place waypoints. The minimap also displays entities, such as players, mobs and items. You are allowed to make videos using this mod. Using it in your modpacks is ALLOWED as long as a link to one of my mod pages is provided and you do not profit from it (Curse modpacks are OK though). Aesthetic and look of vanilla Minecraft. 2 mod editions: full and fair-play. Full version does not have any limits. Fair-play version does not display any entities or cave maps which is more suitable for public PVP servers. 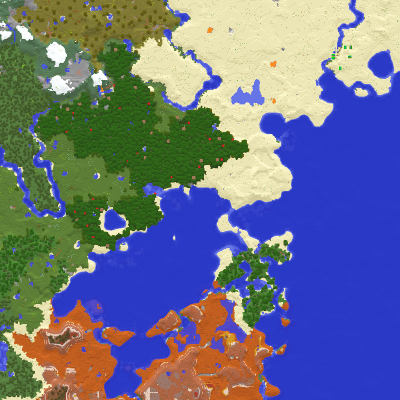 Compatible with Xaero's World Map and can use the chunks loaded by the world map instead of it's own. Option to limit your Minimap usage by binding it to an item that you'll need to have in your hotbar in order for the minimap show up. For example, add minimapItemId:minecraft:compass anywhere in the config file to bind it to compass. Displays players on the map as white dots or player heads. Customizable in the settings. Configurable settings. From minimap size to entity amount. Press Y ingame to open. I just installed this into a fresh 1.13.2 profile on Twitch Desktop but it doesn't seem to have the minimap up by default, is there anything I have to press to open it? It should have it up by default. Try pressing Y ingame and see if the settings open. I'm also having this issue...I thought it might've been the server I was on but I'm not getting any minimap or settings using 'Y' even in SP. I've also tried using the FP Edition with the same result. I had the map before while playing on this same server but took a break for a bit, now that I'm back I'd love to be able to use it again. Try restarting the client a couple of times. Forge is still buggy. Also, putting mods in the /mods/1.13.2 folder no longer works. Is there a way to view the map on a second monitor like Journeymap? This is a stand-alone minimap mod without a fullscreen map. I have a world map mod that adds a fullscreen map but no, you can't view the map on a second monitor (yet). How do i make other players visible on the minimap? It's kind of a shame that me and my friends get separated a lot, and we can't find each other. Also, how do i make my own waypoints visible to him? The players are visible. If you mean waypoints that point in another player's direction then you can't do that. And you can't make your waypoints visible to another player. For some reason the map isn't working in caves. I've got cave maps on, but it's not showing me the cave layouts underground. I'm using 1.12.2. Does it say on (off) on the cave maps option? You probably installed the fair-play version of the mod, if it's so. Is there any way to full screen the mini map and pan around it? You need to also install my world map mod. It's not out for 1.13.2 yet though. Can you make this mod do nothing when installed on a dedicated server? But for 1.13 this funcionality is gone, and now i need to place client-only mods alongside universal ones to keep syncing. Yeah, I noticed that too. They also removed the "clientSideOnly" variable, which is set to "true" for this mod in 1.12.2. I'll look into it more, maybe there's a new way to achieve it. EDIT: BTW, I'm pretty sure the mod doesn't do anything on a server anyway. Do you get a crash? If so, can I see it? Allright, I thought it would be months before there was a map for 1.13.2 that is compatible with forge so now I dont have to write the cordnates down in notepad or play with F3 on at all times anymore. Will be perfect if/when you update the world map mod to work with the newer version as well but at least I can find my way arround without alt+tabing out of the game which has been kinda dangerous (have gotten attacked while alt+tabed out and nearly died once doing it). Anyway, thanks for the work you put in. Thanks for using the mod! Make sure you back everything up though (including the waypoints data) before you use 1.13.2 Forge. EDIT: This is actually one of the benefits of having 2 separate mods for the minimap and the world map. I can release this for people who just want a minimap much quicker. The world map mod update is coming though. I'll probably put the next version of the world map here, which includes 1.13.2. I'm going to port the craftable waypoints mod to 1.12.2 and 1.13.2 after I'm done with another project I'm working on (almost done). Would it be possible to have a config option to show a Biome Overlay on the Mini-Map & World Map? Or some sort of Biome Borderline or something. I'm pretty sure it can be done. Thanks for the idea!